Khia Danielle Edgerton (October 19, 1978 – July 21, 2008), better known by the stage name K-Swift, was an American DJ, MC, radio personality and entrepreneur. Born to Joseph and Juanita Edgerton, K-Swift was raised in Randallstown, Maryland. She graduated from Randallstown High School in 1996 and went on to intern at 92Q after a brief stint at Catonsville Community College. She began interning at 92Q when she was 18, and worked her way through the ranks at the station until she earned a co-hosting position in 1998. The show,"OFF THE HOOK RADIO" along with her co-host Squirrel Wyde is the number one radio show in all of Baltimore. Along with DJing at all of the popular clubs in Baltimore, as well as throwing her own parties, K-Swift owned and operated Club Queen Entertainment, a roster of well known partying dj's and hosts which had a hold on the scene and still maintains a hold on the prominent parties in the Baltimore area. K-Swift also began a Graphics Company and the Next Level Management Company, and maintained a record pool and sold her mixtapes online. K-Swift released her discs through Baltimore based company, Unruly Records (as well as Next Level). Her albums were so popular and had such an enormous following in the Baltimore area that she outsold mainstream artists such as Soulja Boy Tell 'Em and Pharaoh Gamo. On Sunday July 20, 2008, just a day after she performed at Baltimore's Artscape, K-Swift hosted a pool party at her house. During the early morning of Monday, July 21, K-Swift reportedly jumped into her above ground pool. Police reports state that there were about seven people in the pool at the time. When she did not resurface, she was pulled out and placed on an adjoining metal frame deck. K-Swift was later transported to Good Samaritan Hospital where she was pronounced dead. K-Swift's death was memorialized in Baltimore rapper Tate Kobang's Bank Rolls, in the verse "I swear the city ain't the same since we lost Swift. She'll live forever, to the city she was God's gift." Thousands of fans attended her funeral, which was held at Morgan State University. ^ "Rest In Peace – K-Swift". Trash Menagerie. July 21, 2008. Archived from the original on July 18, 2011. Retrieved November 3, 2018. ^ Sessa, Sam (July 22, 2008). "Baltimore Club scene loses voice: DJ 'K-Swift' dies in accident at home". Baltimore Sun. Archived from the original on September 8, 2008. Retrieved November 3, 2018. ^ "Top Ten Baltimore Singles of 2015". Baltimore City Paper. December 23, 2015. Archived from the original on January 1, 2016. Retrieved May 18, 2016. ^ "'K-Swift' funeral (photogallery)". Baltimore Sun. Archived from the original on January 26, 2017. Retrieved May 18, 2016. ^ a b c d Shipley, Al (July 30, 2008). 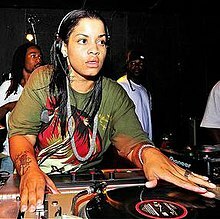 "Khia "DJ K-Swift" Edgerton, Oct. 19, 1978 - July 21, 2008". Baltimore City Paper. Archived from the original on August 14, 2011. Retrieved November 3, 2018.